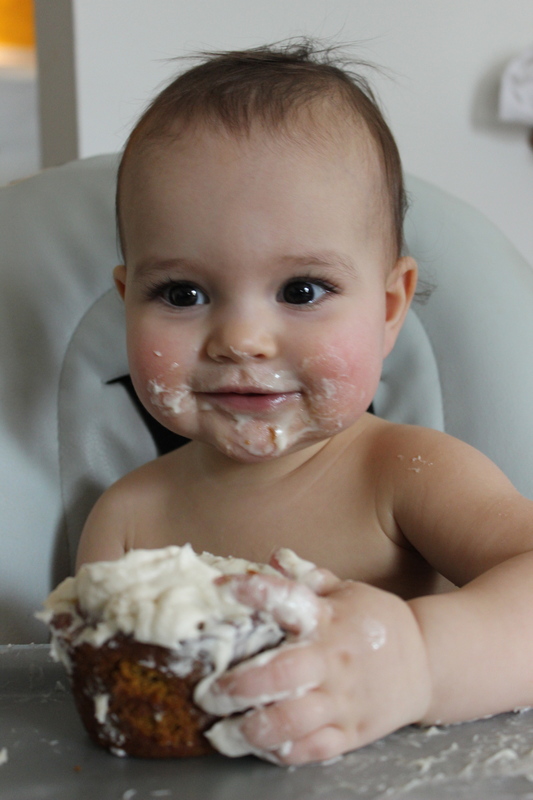 When it came time for my daughter’s recent first birthday, I wasn’t sure how to handle the cake. I couldn’t see ordering a traditional birthday cake. You always end up with a bunch leftover and it just has so, so much sugar. J had never had actual sugar before her birthday. I’m not trying to keep her sheltered forever, but I just thought there must be some kind of compromise — something I could make that the masses might enjoy and our family could eat for days to come if there are lots of leftovers and wouldn’t keep my baby up all night. The fact is — she didn’t know the difference. And i bet she liked this even more than she would have liked cake. Once we helped her get to the actual muffin, she loved it. She seems to love anything with a lot of flavor. We had pies and these muffins (“cupcakes”) topped with traditional cream cheese frosting (laden with tons of powdered sugar. I’m not a total fuddy-duddy). Use eggs for the traditional recipe or flax eggs to veganize them. Thanks to Cookie + Kate for the original recipe! 1. Preheat oven to 325 degrees. Because I only have 1 set of silicone muffin cups, I used paper muffin cups so I could bake more than one pan at once. For my daughter’s giant muffin, I lightly greased a large muffin tin with coconut oil. 2. In a large bowl, beat the oil and maple syrup or honey together with a whisk. Add eggs, and beat well. Mix in the pumpkin purée and milk, followed by the baking soda, vanilla extract, salt, cinnamon, ginger, nutmeg and allspice or cloves. 3. Add the flour and oats to the bowl and mix with a large spoon, just until combined. If you’d like to add any additional mix-ins, like nuts, chocolate or dried fruit, fold them in now. 4. Divide the batter evenly between the ten muffin cups. For these muffins, it’s ok to fill the cups a little higher than you normally would. Sprinkle the tops of the muffins with a small amount of oats if you like, followed by a sprinkle of cinnamon (I skipped this since I was going to be frosting them). 5. Bake muffins for 23 to 26 minutes, or until a toothpick inserted into a muffin comes out clean. Let muffins cool completely before removing from pan (if not using paper liners) or removing paper from them. I actually wish I would not have frosted ALL of them, so I just had some pumpkin muffins to eat after the party. I look forward to making these again soon!